PT Astra International Tbk - Astra International or widely known as "Astra Group" a large and solid business conglomerates in Indonesia. 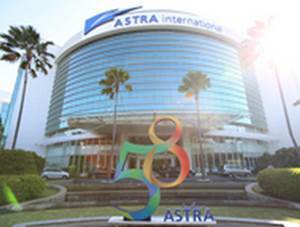 Astra Group has had a presence in Indonesia for more than 58 years. Astra Group was first established in 1957 and commenced business as a trading company under the name of PT Astra International Inc. Later in 1990, the company transformed to PT Astra International Tbk after listed on the stock market under reference code of ASII. At present, Astra Group and its 198 subsidiaries/affiliates/jointly controlled entities are engaged in the field Automotives, Agribusiness, Heavy equipment, Mining and energy, Financial services, Information technology, and infrastructure and logistics. According to PT Astra International Tbk Financial Statements in the third quarter of 2015 (3Q 2015) as quoted by JobsCDC.com, Astra Group reported total revenue of Rp 138.2 trillion in 3Q 2015. This total revenue figures reflected a 8% down as compared to Rp 150,582 trillion in the same period at 2014 (3Q 2014). Astra Group's total net profit decreased 17% from Rp 14,499 billion in 3Q 2014 to Rp 11,997 billion in 3Q 2015. Candidate must possess at least a Bachelor's Degree in any field (preferably majoring in Economics/Engineering). Both fresh graduate and experienced candidates are highly welcome (maximum 2 years of work experience). Deeply interesting in the field of Marketing, Finance, Human Resource. Have a good analytical thinking, high achiever. JobsCDC.com now available on android device. Download now on Google Play here. Please be aware of recruitment fraud. The entire stage of this selection process is free of charge. 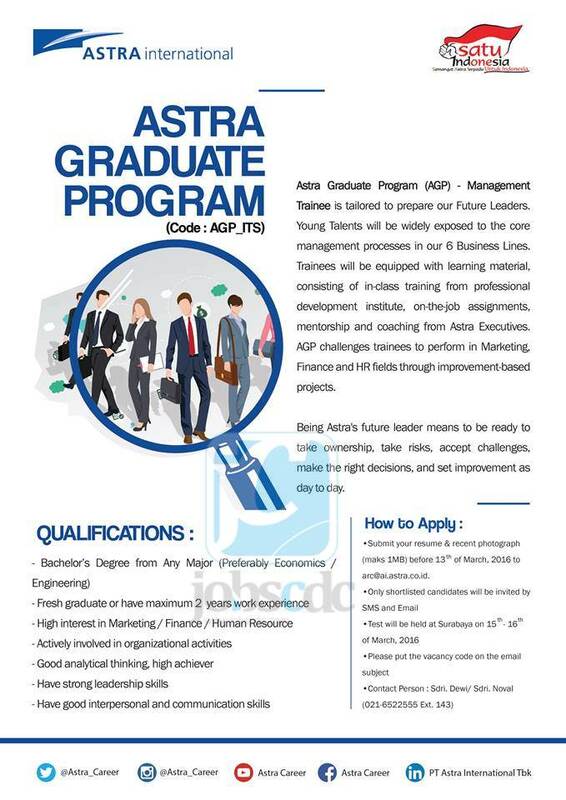 PT Astra International Tbk - Management Trainee Graduate Program Astra Group March 2016 will never ask for fees or upfront payments for any purposes during the recruitment process such as transportation and accommodation.